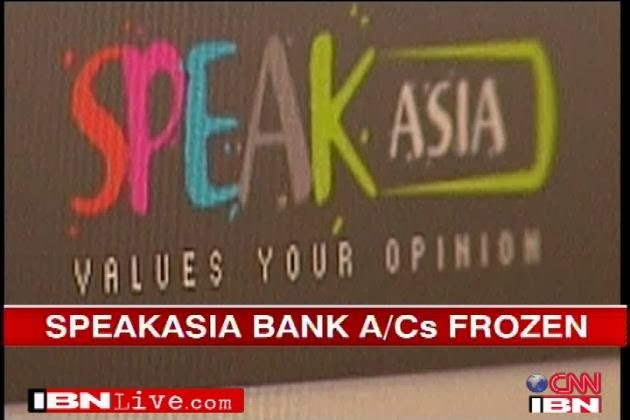 Corporate Frauds Watch filed the first criminal complaint against Speak Asia way back in 2011.The fraudulent company filed a writ petition in Andhra Pradesh High Court appealing to the higher judicature to announce that its scheme is legal. After the High Court dismissed its petition vindicating the stand of Corporate Frauds Watch it closed its operations and disappeared with ill-gotten money. Corporate Frauds Watch demands the confiscation of the people’s money and criminal cases should be filed against the agents who had amassed enormous commissions cheating the gullible. According to the information from Delhi Police, Ram Sumiran Pal, an alleged mastermind of the over Rs 2,200-crore 'Speak Asia' online marketing firm scam in which around 24 lakh gullible Indians were duped has been arrested by Delhi police. He was wanted in at least eight cases of Andhra Pradesh Mumbai, Haryana, Madhya Pradesh. The 37-year-old racketeer, Pal, a resident of Shahajanpur in Uttar Pradesh who was on the run for the last 28 months, was arrested on Monday from Connaught Place after months of sustained investigation by a Crime Branch team led by DCP Kumar Gyanesh, police said. Pal and his brother Ram Niwas Pal, who duped people through a online marketing firm, also had Bollywood links as leading stars would perform at lavish functions held by them for investors and agents to lure more people and the siphoned off money was then also invested in many films, police said. "He (Pal) was involved in a number of white collar crimes. He was in hiding in Dehradun and is wanted in at least eight cases of Mumbai, Andhra Pradesh, Haryana, Madhya Pradesh. He is one of the masterminds of the 'Speak Asia' scam and has also created a number of companies with his brother in order to cheat lakhs of innocent people," said Additional Commissioner of Police (Crime) Ravindra Yadav. Both the brothers Ram Sumiran Pal and Ram Niwas Pal became part of the top management of multi-level marketing companies registered in foreign countries like Singapore, Italy and Brazil, which by their international profile, attracted more investors and also helped them in money laundering at a later stage, police said. A company namely Speak Asia, registered in Singapore, was introduced in India in early 2010 by these two brothers with the help of one Manoj Sharma. Speak Asia was an online survey marketing company which sold web subscription for Rs 11000 each and in return the investor had to fill survey forms, which were later found to be fake, for certain MNCs for promised annual payment of Rs 52000. It may be recalled Vijayawada-based Corporate Frauds Watch has filed a criminal complaint against the fraudulent company in 2011. After the Andhra Pradesh launched criminal proceedings against the fraudsters Speak Asia wrapped up its operation in India. According to police, 'Speak Asia' had remitted over Rs 900 crore to Singapore. The money was sent from India to the banks in Singapore and from there to Dubai, Italy and UK. However, the money came back from UK again to UAE (Dubai) and to India. They used to have seminars and functions at different places. The promoters of the company, including Ram Simran Pal, used to travel all over the country and address meetings and seminars of their agents and investors in luxury hotels all over India. They acted like big tycoons having a lavish lifestyle to encourage the agents to bring more and more innocent people in the net. "On one such occasion, the promoters held a meeting of the investors in Goa. They hired a special train to Goa for the investors and an exclusive portion of beach of a resort was booked. "The open invitation to attend this meeting was given on the portal of the company and this was attended by thousands of people and their expenses were borne by the company," said Yadav. In order to entertain the investors, leading stars of Bollywood performed in this programme. "There is no doubt that booking a special train and performances by film stars for a big bash at a beach resort in Goa was done to attract more eyeballs and therefore, hook more gullible people, who might choose to join the MLM scheme," he said. The company had duped over 24 lakh investors. The amount of scam has gone up to Rs 2,276 crore. A number of cases were registered in different States. Thereafter, all the senior office-bearers of the companies went into hiding. 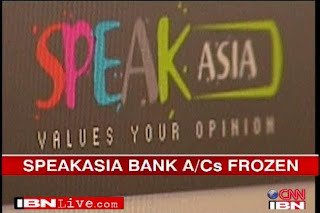 As per DCP Kumar Gyanesh, after the registration of criminal cases against the company in June 2011, 'Speak Asia' shut down its business, but its Directors and office- bearers handled the internet portal and told investors that no case has been made out against the firm and the firm will be restarted soon. Despite vehemently denying the fact that Speak Asia was not just making up its surveys and relying on new membership fees to generate profit, it has come to light that Speak Asia's surveys were indeed fake and were just an eye wash, he said. The Economic Offences Wing (EOW) Mumbai is investigating maximum number of cases of 'Speak Asia' fraud case since the last 28 months. It is reported that more than 210 bank accounts containing over Rs 142 crore have been frozen. Besides this, another 150 bank accounts are reportedly under investigation over suspicion of funds being transferred in the scam, said Gyanesh. After escape from Mumbai, Ram Sumiran Pal settled in Dehradun with his in-laws. He invested the ill gotten money in real estate and started construction projects in Dehradun. He also purchased office and residential spaces in Mumbai, besides agriculture and commercial land in Shajahanpur, UP where he wanted to construct a luxury hotel, police said. Hi… I am Kanika Kaur. I want a commercial office space in noida for business purpose. Someone suggest me to contact your office space. I think Your Office Space is a very small real estate agent, he will never provide me our requirement. But I contact them and he provide me our requirement, Commercial Office Space Space in Noida which is suitable for our business.